Charred Veggies with Grilled Avocado for an easy and delicious grain-free + plant-based recipe! There are very few things in life I love more than an avocado. Call me basic, boring, weird, whatever but I am 100x more satisfied with my meal when there is a fatty, creamy, buttery avocado involved. Back in the day (aka 6 months ago) when I didn’t eat meat, I was always looking for different grilling alternatives. While grilling fish and veggie burgers taste delicious, it got pretty old quickly. That is when I started making GRILLED AVOCADOS! Something that I was a bit hesitant about at first, but then quickly fell in love with them. 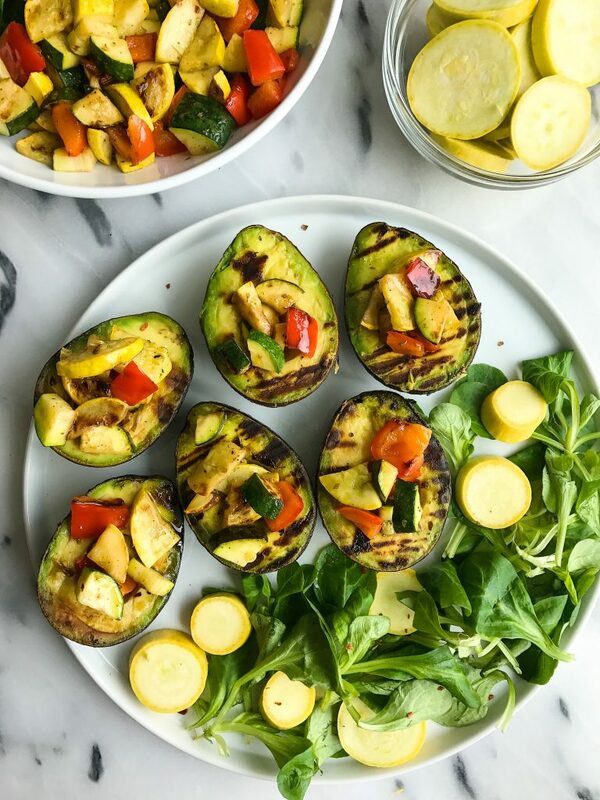 These Grilled Avocados with Charred Veggies are the ultimate vegetarian summer side dish and they are so simple and easy to make. Plus they are the perfect canvas for you to add your favorite protein on top. I added some grass-fed beef burgers when I made these and was in flavor heaven. 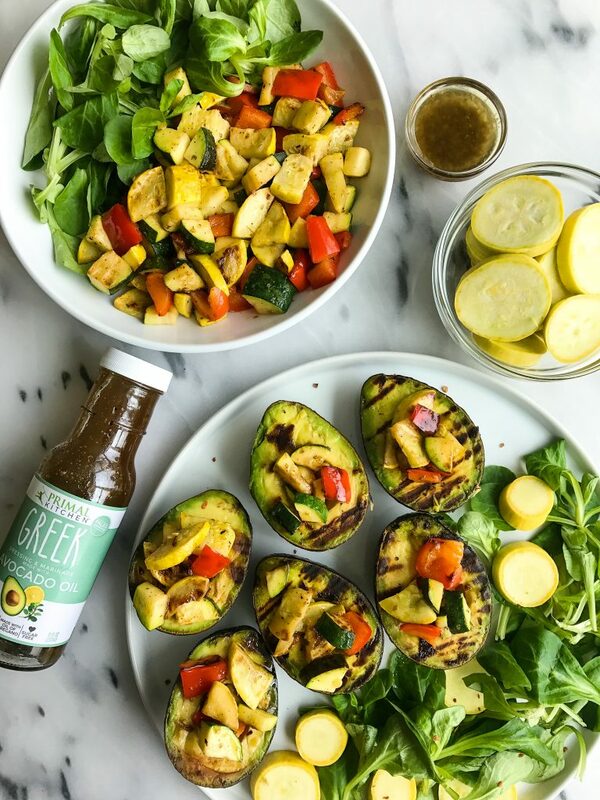 I stuffed charred veggies in the avocados and used Primal Kitchen Greek Vinaigrette + Marinade to take the veggies up a notch. I love using PK products because of how simple they are and the ingredients are actually something I can get down with. This greek dressing is made with avocado oil and oregano oil. Please it is non-GMO, sugar free, canola +soybean oil free and gluten-free. All of Primal Kitchen’s products are free of gluten, dairy, soy, canola, GMO’s and refined sugar. They make everything from dressings to mayos, protein bars with collagen and Jord’s recent favorite, chocolate coconut collagen fuel. It is a chocolatey delicious protein that Jord (the pickiest protein powder eater ever) actually loves. I am also super excited to share that Primal Kitchen’s dressings are now in WEGMAN’S! Hello epic. I am originally from New Jersey and Wegman’s has always been a staple in my family’s life. And by family, I mean my mom and I since we do all the food prep and shopping. I dream of Wegman’s often (no joke) and their amazing meat selection and the endless product options they have. I am so thrilled for Primal Kitchen that they are now sold there. It is SO exciting! If you leave near a Wegman’s, swing by and pick up the dressings (there is a coupon here) or order some online if Wegman’s isn’t near you! 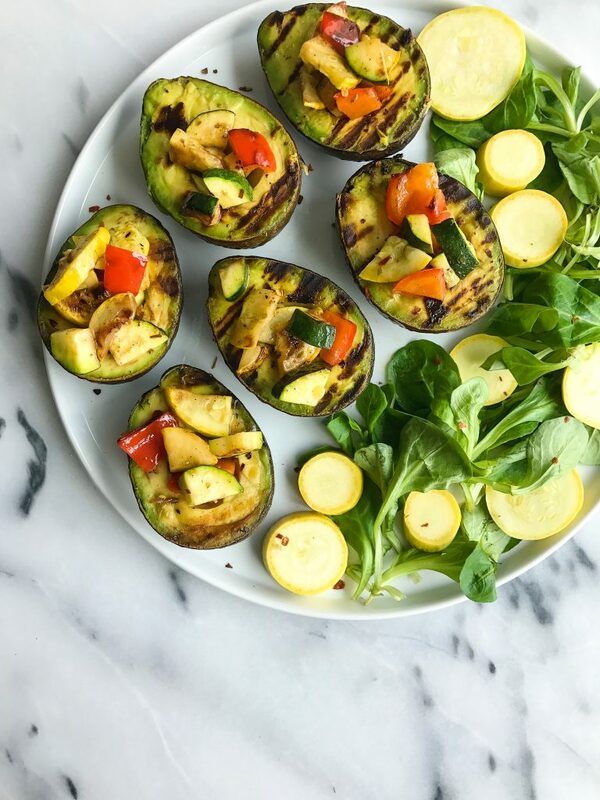 Then you can make these delicious Charred Veggies with Grilled Avocado for your next BBQ. uk don’t have that dressing so what can i do put stuff in my veggie as I have 3 over ripe avacodo n not use it due to fatty n try to lose weight .